What You Need to Know Before Investing in a Shade System for Your Community! If you’ve spent anytime outdoors on a playground, lunch table, or park mid-day in Hawaii you’re already well aware of how hot it gets in the sun! I’ve seen many an empty playground or park during the day because it’s just too hot to play comfortably. Many families simply won’t go to parks without shade for this reason. Investing in shade for your community space is a smart decision that will increase the comfort of end users and make the area more accessible throughout all hours of the day. Shade will also help extend the life of your playground and park equipment by protecting it from the sun’s harsh UV rays that cause aging of rubber safety surfacing, turf, and plastic play features. Hip Shades: Four posted square or rectangular hipped systems are the most common and cost effective. 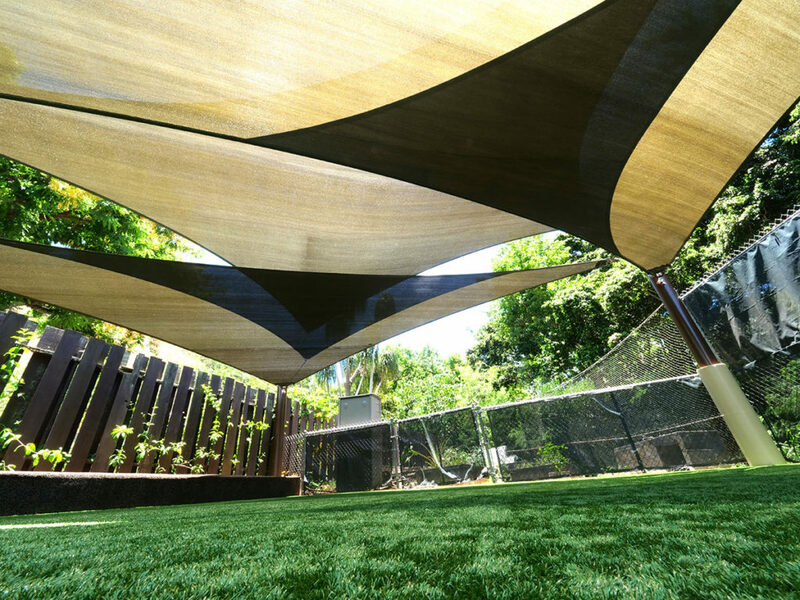 They provide a solid mass of shade and come in standard sizes and can be customized in width, length, and height to accommodate the needs your particular space. Cantilevered Shades: These are the most expensive option but require less posts than other systems providing less obtrusion to the grounds with extra posts and can be tilted. They are well suited to covering seating options such as bleachers. 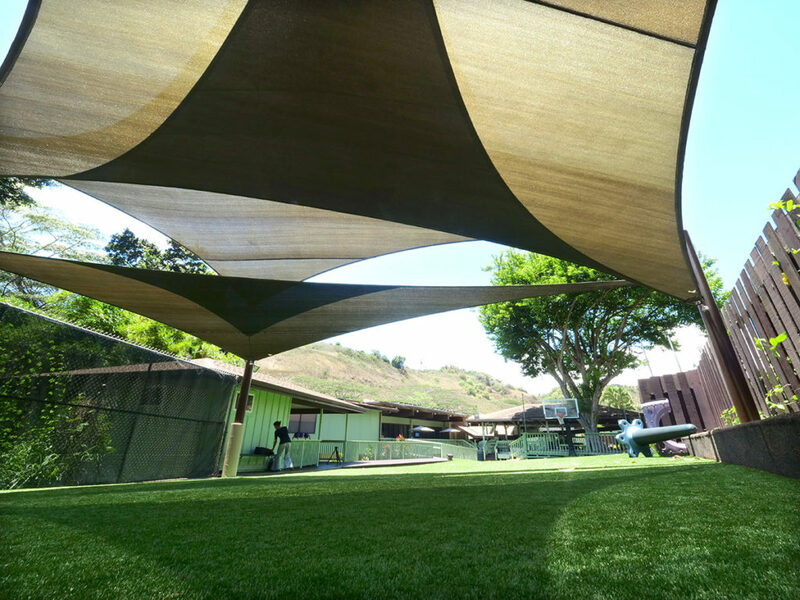 These shade structures are classified as permanent structures and therefore must comply to local building codes and permitting requirements for such. This is in part due to the large concrete footings that must be placed below ground to secure the shades so they can safely bear the wind loads placed upon them. Local enforcement agencies want to be sure your shade won’t end up causing injury or damage every time the wind kicks up. Local permit requirement vary from island to island in the state of Hawaii so you’ll want to inquire with your Dept. of Parks & Planning to become familiar with the requirements for your area. Certain facilities can apply for permit exemptions if they’re located on military bases or state property but most public and private organizations and facilities are required to go through the permitting process. The permitting process will take time (a few months at least) and the added cost of at least a few thousand dollars so you’ll need to plan for extra time and finances to allow for these project expenses. You can handle the permitting process on your own or request that IPR Hawaii include these services for you as part of the contract for your project. Each shade structure is produced per project, on the mainland with our shade manufacturer Superior Recreation Shades. They generally have a 10 – 12 week lead time for production and will then need 2 – 3 weeks to ship here to the islands (if you’re outer island you may need to add an extra week to that general time frame.) The first portion of the project will be digging and pouring concrete for the shade footings. After this is done the concrete will need to sit and cure for a few weeks before the shade can be fully erected and installed. For shades with large square footage or extra entry height requirements, special equipment may be needed to erect the posts and attach the fabric. This includes machinery such as: forklifts, man-lifts, and cranes which require lots of space and good access to the installation site. The overall project cost for a shade project will vary greatly depending on lots of factors such as: the amount of the shade needed, style of shade system, permitting, location of shade project (ex. outer islands), and any special conditions that exist on-site. Generally speaking though the cost of investing in a typical shade system project will land you somewhere in the tens of thousands. CONTACT US to consult about a shade project for your facility and request a free estimate whether your just planning your budget for a future project or have already received funds and are ready to proceed. No matter where you are in the process we can help!